New Leaf is a worker-run co-operative wholefood/organic/eco-products shop. 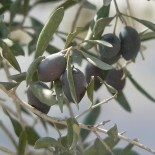 It currently stocks Palestinian Fairtrade olive oil and olives from the Zaytoun brand, whose olive oil and olives are sourced mainly from the Jenin area of the West Bank. New Leaf are also looking into stocking other Palestinian products in the future. This entry was posted on November 28, 2012 by Sarah Irving in Food, Olive Oil and tagged Edinburgh, Fairtrade, Jenin, Marchmont, olive oil, olives, Palestine, West Bank.